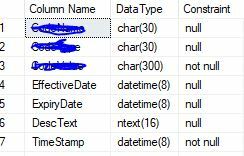 I need to write a query on SQL server to get the list of columns in a particular table, its associated data types and their length and if they are not null. I have managed to do this much. But now i also need to get in the same table against a column - TRUE if it is a primary key. How do i do this ? To avoid duplicate rows for some columns, use user_type_id instead of system_type_id. Just replace YourTableName with your actual table name - works for SQL Server 2005 and up. The stored procedure sp_columns returns detailed table information. to get all the metadata you require except for the Pk information. This will give you the column names along with their properties. To ensure you obtain the right length you would need to consider unicode types as a special case. See code below. wite the table name in the query editor select the name and press Alt+F1 and it will bring all the information of the table. To search which column is in which table based on your search data type for three different table in one database. This query is expandable to 'n' tables. Run SELECT * in the above statement to see what information_schema.columns returns. Find combine result for Datatype and Length and is nullable in form of "NULL" and "Not null" Use below query. you will find result as shown below. Not the answer you're looking for? Browse other questions tagged sql sql-server sql-server-2005 or ask your own question. How can I inexpensively determine if a column contains only NULL records? SQL Server query to get data type for all columns in table? Searching for text over multiple columns?